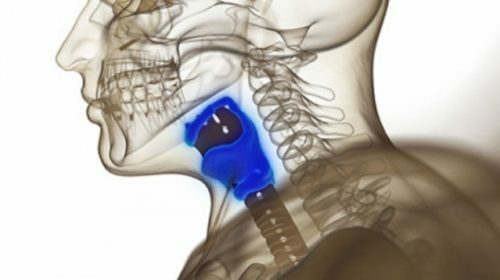 Sixteen months after receiving an artificial larynx, a 56-year-old French man suffering from throat cancer can now whisper and breathe normally. A report published this week in the New England Journal of Medicine considers this to be a significant first achievement. This is the first time that doctors have observed a patient with the implant long term recover functions such as breathing and speaking after the complete removal of the larynx. Thanks to an artificial voice box, implanted in 2015 at France’s Strasbourg-Hautepierre university hospital, the 56-year-old Frenchman, who lives in Alsace, can now whisper in a comprehensible manner and breathe normally. The patient has also recovered his sense of smell, which was damaged by the removal of the larynx. Other than the vocal cords, the larynx features an upper valve, called the epiglottis, which closes when food passes down the throat to prevent it from entering the windpipe. The prosthetic larynx was developed by a French company called Protip Médical. It consists of a rigid titanium and silicone structure replacing the larynx and a removable titanium part that mimics the function of the epiglottis. The only problem that remains unresolved in the implant is the function of the epiglottis. As a result, the patient coughs from time to time when eating, as food accidentally enters the windpipe. However, the surgeons still consider the functioning implant a highly satisfactory achievement. The current procedure used to return voice function to throat cancer patients involves puncturing the throat to insert a valve allowing air to pass from the windpipe to the esophagus. A few doubts remain about the long-term effectiveness of the implant. For example, blockages caused by dried out mucus and secretions from the lungs and nose could be a risk. Another concern is the risk of rejection, particularly in cancer patients who have undergone radiotherapy or chemotherapy treatments. As for patient comfort, further testing will establish how the mobility of the patient’s neck is affected by the presence of a rigid tube in the throat. “This implant is constantly evolving and the next patients will benefit from substantial improvements,” notably to improve the passage of food down the throat, said lead researcher Nihal Engin Vrana. Each year more than 12,000 new cases of throat cancer are diagnosed in the U.S.. Larynx transplants remain extremely rare worldwide and are generally used in cases unrelated to cancer, which represent a small majority. Source: The report is published in the New England Journal of Medicine.